The Palms B&B served us well, although a little disappointing that we didn’t have a sea view (not the end of the world), the room was really nice and the bathroom and facilities excellent, the breakfast, as you should know if you’ve read my posts from previous years, are a key part of the day. We tend to take a light snack with us on route, with of course plenty of fluids. With a big breakfast and a good evening meal we are then set. The weather was not predicted to be very good with possible heavy showers coming through. This in-fact is what occurred, the weather forecasting has been pretty good, I’ve on the whole used the BBC IOS weather app. We did get rather wet and it doesn’t matter how much proofing you apply to boots and clothing persistent rain will get through. On the good side it was still quite warm and with the breeze we soon dried out, although the boots were a different issue. From Bude to Widemouth Bay we had pretty reasonable weather and I took few shots with the iPhone on route, these I think turned out quite well, of course you can make your own mind up by taking a look on the images page for SWCP 2014. From Compass point we headed toward Efford Beacon with some great views back along toward the Radio Station, heading up to Upton and then onto Widemouth we had the road quite close to us on the left but traffic was light and didn’t interrupt our enjoyment of the walk. As we arrived onto Widemouth Beach the weather was taking a turn for the worse and the start of some inclement weather hit us off and on until we almost reached our destination. Although we both have a pragmatic view on this sort of thing and make light of the situation and still enjoyed the walk as much as if the weather was fine. At Widemouth we, coated and bags covered, headed to the beach and again walked along past all the surfing groups, almost joining in with one of the warm up sessions that they were so rigorously going through. We headed toward Foxhole point getting a bit wet. Foxhole has a car parking opportunity so if you are in the area take advantage as the views, if it’s clear are great, fortunately the weather had given us the chance to take a drink and a quick nourishing cereal bar, it’s funny how good those things can be when you are ready for them. For those who have read the previous blogs and know Annes liking of seals, we did take a little while at this point looking for them however I think that is still to come, not today though. From this point is rained rather heavily and we but we had numerous amounts of time having to walk on the road and not seeing the sights quite as well as we’d have liked. The climb down to Millook was a bit sloppy on loose rock and after the rain at times treacherous. It is here that you can see some wonderful rock formations and folds, again you should be able to see the shots on the SWCP 2014 images page. The rest of the walk was pretty uneventful however I must point out that there are 2 or 3 rather steep valley’s to pass and if it’s windy and wet it’s best to have your sticks with you. Yep I had put our walking sticks in our bags for transportation to the next B&B. On this section we walked past the highest point on the SWCP route in Cornwall at 539 feet (164 Mtr) near Dizzard Point. We arrived at out overnight stop Combe Martin Inn tired and ready for a drink and some food. We ended the evening watching a lovely sunset hoping that the saying ‘Red Sky at night, shepherds delight’ is accurate. I can highly recumbent this section, although strenuous it has (even in the inclement weather) some spectacular vistas. If you have been thinking about doing a long distance walk, certainly in the UK then look online for a company like Lets Go Walking as they take the strain out of organising the accommodation and transfer of luggage and you, and the experience is well worth the effort of the walking. I’ve also added some short unedited clips of the Time Lapse walk on the video Page. 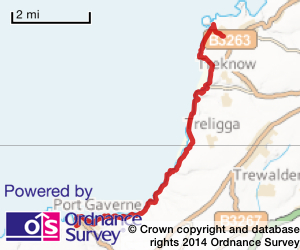 14.72 miles Distance, including extra walks to beaches and to the ends of any points we visited. Total time out including stops photo opportunity, enjoying tea and cake, 6 hours 10 mins. Total this week 17 hours 11 mins. Total walk time out 90 hours 58 mins. An extra piece of info from my Fitbit total Steps = 34263 including extra walks to beaches and to the ends of any points we visited. It does include some backtracking as I had lost power to the GoPro, luckily it was close to the end so I retraced my steps, to capture the walk.